The world has engaged in a love affair with women’s gymnastics since the 1970s. It began with Olga Korbut taking center stage in the ‘72 Olympics, followed in ’76 by Nadia Comaneci executing moves never before seen on the uneven parallel bars and balance beam. Mary Lou Retton captured America’s hearts just as she captured the gold in the ’84 Olympics. With spectacular feats of daring, fresh-faced competitors and glittering uniforms, what’s not to love? Especially in today’s sedentary culture where childhood obesity is nearly epidemic, what could be more positive than young girls participating in wholesome athletics? Speaking of girls, ever notice how incredibly young these gymnasts are? That’s no coincidence. Back in the 1960s, after Soviet gymnasts had astounded the world with highly disciplined and difficult performances, international competitions began to ramp up in intensity. This led coaches to look for younger and younger children who had not yet developed a normal fear response. It was only these fearless girls who could be trained to perform daring, very possibly dangerous, routines. The same holds true today. Returning to the question: what could possibly be wrong with girls participating in gymnastics at a high level? Only one thing: the possible advent of an eating disorder. Generally, athletes across the board are at a higher risk for developing an eating disorder than non-athletes; specifically, females in any sport, and especially in a sport such as gymnastics, are at the highest risk. In a 1992 NCAA survey, 51% of the gymnastics programs that responded reported eating disorders among its team members, a far greater percentage than in any other sport. 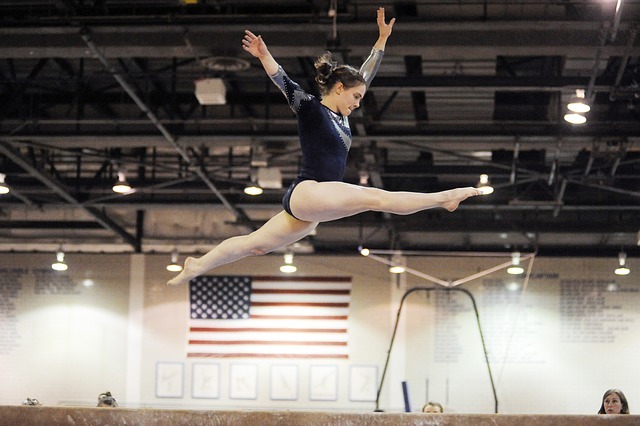 Several factors conspire to make gymnastics a sport rife with eating disorders. Certain sports are strictly performance-based. Sports such as archery or weight lifting care not in the least what a competitor looks like. Not so with sports such as ice skating, ballet, dance, and certainly gymnastics, which requires a certain body type and weight. Success in this arena tends to be equally appearance-based as performance-based. A girl must be thin to win; this need only increases as she moves closer to competing at an elite level, such as in the Olympics. Another factor is that gymnastics is a judged sport. In other athletic competitions, the man who crosses the finish line first, or the woman who racks up the highest score at the end of the game, wins; not so with gymnastics. Because certain aspects of judging can be subjective, appearance becomes even more important. The pressure for physical perfection is enormous. Research indicates that female athletes in judged sports have a 13 percent prevalence of eating disorders, compared to just 3 percent in the general population. Another factor is the close relationship a girl has with her coach. Coaches are often male and can be strict and demanding. In an effort to ensure a competitive edge, they may instruct girls to lose weight, teach them how to diet, tell them what they can and cannot eat. Routine weigh-ins become the norm. Gymnastics, as with most sports, is extremely competitive. If a girl is highly perfectionistic and achievement oriented, she is a good candidate for anorexia to take hold. This is particularly the case as young female competitors approach puberty. A sport so inextricably linked to small, firm, lean bodies is contrary to a womanly form defined by developing breasts and rounded hips. Whereas most young girls in American culture eagerly anticipate the advent of puberty and the physical changes it inspires, a female gymnast might fear it because it could signal the end of her competitive career. Therefore, she might turn to starvation to negate normal maturation. Of course, what she probably doesn’t know, and might disregard if she did, is that ongoing starvation leads to countless medical complications, even death usually due to heart failure. Cathy Rigby, famous gymnast and eating disorder sufferer, experienced cardiac arrest twice. There are two primary reasons why an athlete gets caught up in bulimia. To maintain a low weight, she might start with severe restricting, which does accomplish the desired result for a long period of time. However, starvation is exactly that: the body is slowly dying from lack of food. Even the “best” anorexic can lose control and succumb to a binge. The self-disgust felt by this loss of control and the hated caloric intake are compensated for through purging. Just as anorexia worked initially, bulimia now achieves the desired effect. The second reason for embracing bulimia is due to the incredible pressure placed on these young athletes. Bulimia is the quintessential example of an eating disorder being involved with feelings, not food. The constant stress of competing, the pressure to win, the hopes and dreams of so many riding on her, and her alone to take them to the next level. Some girls will turn to bingeing and purging to cope with the emotional turmoil. While consuming huge quantities of food, she is not worried about the next competition, how she will perform, how the officials will rate her efforts, she is focused only on the food. Then, the subsequent purge is actually stress-reducing and results in a feeling of calm, which is to a large degree, what she craves. Just like anorexia, bulimia is addictive and can result in long-term medical complications and can prove fatal. Regardless of whether a girl struggles with anorexia or bulimia, recovery is possible, especially if she is young and the eating disorder is relatively new. Yet, though weight may be restored and health regained, serious thought must be given to when or if she will return to training or competition. One factor is her motivation. Does she want to return to competition due to a real love of the sport, or is pressure being applied by a coach, teammates or even family members? Just because a girl is highly skilled in gymnastics doesn’t mean she must compete, especially if it is to fulfill another person’s dreams. It is important to know, however, that with the right treatment team, support from parents and coaches, a girl can return to gymnastics, this time with her health and future intact. @ 1999 by John Wiley & Sons, Inc. Int J Eat Disord 26: 1 79-1 88, 1999. Article Contributed by our Sponsor -Timberline Knolls.